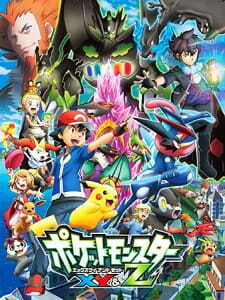 Other: Pokemon XY&Z: Subete no Nazo wo Tokiakase! First off, a little background. I have been watching the Pokemon anime on and off since I got into the franchise. I watched a few episodes of the original series, some from Hoenn and nearly all of Sinnoh, but ditched the show in Unova for reasons most people already know (aka that series sucked). I wasn't planning on watching Pokemon XY since I found the games pretty underwhelming, but one day, my computer broke so I had to wait a few weeks for it to get fixed. During that time, I did what any person would do in that situation: watch anime. I was going to rewatch the Sinnoh series since I remembered it being pretty good, but then I saw an episode of Pokemon XY about to start on my TV, so I figured, "Why not watch an episode?" Surprisingly, I found myself enjoying the episode a lot, so I spent most of my time that week binge watching every episode of Pokemon XY that was out at the time. By the time I was finished, Pokemon XY&Z had begun airing. Now, Pokemon XY was pretty average anime overall, but XY&Z was amazing! Let's talk about why this series was, and probably will forever be, the greatest season of Pokemon. Story: The story of this season was so well structured and the development of the plot and characters was great! I'll get more into the characters later, but I think that this season had some of the most emotional episodes of Pokemon ever. Of course, everyone remembers "Pikachu's Goodbye" from the original Pokemon series, which was incredibly sad, and I could probably think of some other example if I thought about it more, but XY&Z has brought me to actual tears on several occasions, which I won't go into as to not spoil it from anyone. XY&Z also had the best villain arc in Pokemon to date. Even as the series is ending, you can still feel the effects of Team Flare's actions on the protagonists. I'm going to stop myself here so I don't spoil anything, but I'm just going to leave it with this. The setup of events in this series is great, and when you finally reach the payoff of it all, even if you already know what's going to happen, not only does it hit you in the feels, but it hits you hard. Episode 41 (I'm pretty sure that's the episode) in particular has some fantastic payoff moments, that even though I know what's happening, I still get a little choked up each time I watch them. 9/10 right here. The art in this series is also fantastic. The animation in some of the battles, particularly Ash vs Sawyer and Ash vs Alain in the Kalos League, is really amazing. Definitely the best the Pokemon anime has ever looked. You can really see the detail that went into to every attack that every Pokemon uses, and it looks freaking great. It's so great that I am running out of adjectives to describe this series! As for how the characters look, each of them has their own unique and interesting look that tells you a lot about who they are. For example, Alain's design has the same colors and a similar style to his ace Pokemon, his Mega Charizard X, which tells you a lot about their relationship without you having to go watch the Mega Evolution specials (even though you totally should). The art gets an 8/10. The music and voices in this anime are all fantastic. Well, kind of. You see, I watched the subbed version of XY&Z, and I rarely watched subbed anime unless the dub is really unbearable. From what I just said you can probably guess how I feel about the dub. The intro music to XY&Z in the sub is upbeat and fast-paced, which makes it perfect Pokemon like Greninja, who gets a ton of battles this season. The intro music in the dub however, is slow and doesn't fit well with the battles. When Greninja is jumping all around the battlefield firing off Water Shurikens, you would expect the music to be fast, like it is in the sub, but the dub kind of throws that away. Then there is the voices of the characters, I haven't seen much of Ash's dub voice actor in XY&Z, but I did watch a few battles dubbed just to see how well the VA did, and it was not good at all. The English VA for Ash just doesn't have the energy and emotion that the Japanese VA does, which is important for this series. Also, Sawyer's dub voice is unbearable. That's all I have to say here. Since I watched this series subbed though, I still give it an 8/10. Characters! The best part of this anime. Let's take it one at a time. Ash, our main character, is a lot smarter and a better battler than he has been in previous regions, and you can really tell how much he cares for his Pokemon. This theme of Ash caring for his Pokemon was established way back in the 2nd episode of Pokemon XY, and comes full circle with Ash-Greninja in XY&Z. That is just awesome. Speaking of Greninja, let's give him his own little space here. Ash and Greninja's bond is a major part of XY&Z, and something they have been building up to since Ash originally caught Froakie way back in the beginning of XY. You can really tell how much of a struggle it is for both Ash and Greninja to handle the power they gain this season, especially after a particular streak of losses half-way through the season, which I won't spoil. Even though I don't like the way Ash and Greninja's story ended, it was a still a bittersweet moment for Ash's best Pokemon. Next is Ash's companion, starting with Serena. Serena is one of the best travelling partners for Ash, and she has a character arc that no other female companion of Ash's goes through. Hell, she even changes her design half-way through XY. What!? Literally, no one else does that. Ever. She has a lot of very powerful and emotional scenes throughout XY&Z, however I can't say more due to spoilers. Although, she has got the best ending to any female companion's story ever. Those who have seen it know what I'm talking about. I really hope Serena comes back at some point in the Sun and Moon anime. Next is Clemont and Bonnie. There's not really much to say about Clemont, as his character arc with Ash was pretty much dealt with back in XY, and Bonnie is usually just an annoying character who has a freaking legendary Pokemon in her bag. Although, I have to say, her role in the Team Flare arc was sad and amazing. One of the best moments in the whole series. Finally, I'll cover Ash's rivals, Sawyer and Alain. These two serve as interesting counters to each other. When we first meet Sawyer, he is weak and a bad battler, taking down every note he can to try and become stronger one day. Ash acts as a teacher of sorts to Sawyer, guiding him to becoming a better trainer. Overtime, you can really see the progression of Sawyer as he becomes a better trainer. I really loved the idea of Ash helping this weak Pokemon trainer get stronger, only to realize that Sawyer has become even more powerful that Ash in some ways. It's stuff like that that make Ash and Sawyer's last battle my personal favorite in all the seasons of the Pokemon anime. Alain, on the other hand, meets Ash already leagues ahead in terms of strength. So, we got Sawyer, who started as weak trainer, slowly becoming stronger than Ash and Alain who is already stronger than Ash. These two characters are fantastic rivals to Ash, and I love the ending of both of their final battles with Ash (okay, I didn't love the ending of Ash and Alain's battle, but the rest of XY&Z is so great that can't really feel good about hating on this one point, even though the end result is very frustrating). Characters get a 9/10. I absolutely loved this season of the anime if you can't already tell. It has emotional moments, amazingly animated and energetic battles, and still has the humor and fun that you'd expect from a Pokemon series. Even the filler episodes were fun to watch! There is not really much else that I can say that I haven't already said. 9/10 in the enjoyment category. I looked forward to this anime every week when it came out. If you've been wanting a more mature story out of Pokemon, while this may not be exactly what you're looking for, it is still great and takes on some themes that are pretty mature, just not in the same way that an actual adult anime would. With the previews for the Sun and Moon anime having already came out, I am not liking the chances for us to get another fantastic season of Pokemon. No matter how bad, or good the Sun and Moon anime turns out to be, we can still always turn to XY&Z, the best season of the Pokemon anime. The 4 main characters are absolutely amazing and I actually cried when I saw the last episode when everyone says goodbye, it made me so sad thinking that I will never see this art style nor Serena, Citron and Yurika as companions ever again, it can get boring at times or a bit childish (but it's aimed to children so no point putting it as a negative) but for being the pokemon anime and definitely aimed at children this season has a lot of depth and character development, I absolutely loved it and even though I wouldn't watch it again (personally took me a lot of effort to watch it all) I highly recommend it to anyone that loves Pokemon. I first started to get the impression that this season could be something really amazing around episode 10. I'd been worried that Team Flare's inclusion would seem rushed, but their plot was really well done. I didn't think Zygarde was a thing until Sun and Moon, but in hindsight, this actually tied into their schemes a lot better than their plot in the games. (Honestly, I'm still not really sure what the giant and his Floette had to do with anything.) And yes, Bonnie taking care of "Squishy" was just a little too cutesy a lot of the time. But they did a great job of making Team Flare seem actually threatening. Like I said, episode ten was genuinely moving, which I don't usually expect from Pokemon. Not stemming from anything serious, anyway. That image of the kids sitting around the campfire, struggling to come to terms with their feeling powerless to protect a friend... It was the first indication that XY&Z was going to be something really special and not just the standard Pokemon fare, even dramatic as that can be. And the writers didn't disappoint. There are just so many things to praise here. Likable characters continuing to be developed? Excellent. Ash and Greninja having a Digimon Tamers-esque connection and power? Never something to complain about. Giving Steven a role to play after totally stripping him of his importance in his own season? Yes. Any time. And the new characters really grew on me. Alan was mysterious but not overly angst-ridden or edgy. Sawyer was an interesting case. I started out not thinking much of him one way or another, but in the end, I wouldn't have been disappointed if Ash lost that battle and Sawyer ended up becoming champion. He grows so much in such a short time and has one crucial skill that Ash lacks-- adaptability. To this extent, anyway. A lot of this season kind of became about showing off all the mega evolutions, and I know they make sure we know it requires a strong bond between Pokemon and trainer, but honestly, I would have loved to see that sort of raw power overcome by a really good strategy. Honestly, parts of the Pokémon League itself felt a little rushed. I mean, we all knew who the important players were going into it, but the beginning stages with all the competitors help to really give it the feel of a tournament. And this season it was literally opening battles one episode, semi-finals the next. We don't even get to see all of Ash's battles in full. But honestly, even that is a little hard to complain about when the end of the Pokémon League blends so effortlessly into the major plot of the story. And damn was the final arc done well. I mean, all the regional villains' plans are at the world-takeover/destruction level, but usually it feels like they really only affect Ash and his friends. I love that everyone had a role to play here. I've always been of the belief that kids' shows are at their best when the material isn't treated like it's for kids. You know, the danger dumbed down and made to be obvious that the heroes are going to triumph. Everything was just as dramatic and high-stakes as it should have been. The writers played all their cards so well. I was getting actually emotional over the comic relief/plot device robot! (Seriously, though, that scene-- with the dramatic music playing instead of the explosions-- was done particularly well.) And Clemont! How is it that we spent twice as much time with Brock, but I am twice as attached to Clemont? I know I'm gushing. But I don't think I can truly impress upon you how good those final episodes got. I mean, the gym leaders all band together to form a sort of elite Pokémon army. Do I even need to say anything else? And the conclusion of Serena's character arc impressed me as well. I think it's safe to say she's grown the most of any character, and the fact that her journeys are going to take her into the contest realm kind of smoothed out any lingering dissatisfaction I had. I still can't really respect the showcases... The judging is so subjective (and open to so much bias, because let's be honest, everyone is going to vote for their friends, regardless of whose performance was actually the most impressive), and particularly in Serena's case, it's literally just a trainer and their Pokémon prancing around on stage. But I think it's a good starting point to get into the world of contests. But mostly, Serena going off on her own is just so satisfying to me. She was so aimless starting out. I know her reasoning for splitting off from the group was almost identical to May's-- that she needed to really be able to depend on herself-- but it feels more impressive for Serena. I kind of mentioned in my last review that the basis of her character was just this shallow love interest for Ash. It was nice to see her grow into a full-fledged character. Someone who greatly admires Ash but isn't totally lost without him. Ugh. I just love it all so much. I've decided to take a break from Pokémon for a while-- maybe start similar journeys back through my other childhood shows-- but now I almost don't feel ready to move on. Congratulations, Pokémon. You started out as just a kids show that had some good moments but was mostly just good for background noise while I took notes... but have become something truly great. I feel like this season could honestly stand on its own as a great anime, without the need of the Pokémon franchise's history of success. This has been a long journey for me. And I'm happy to say that at the end of it all, it feels like it was worthwhile.